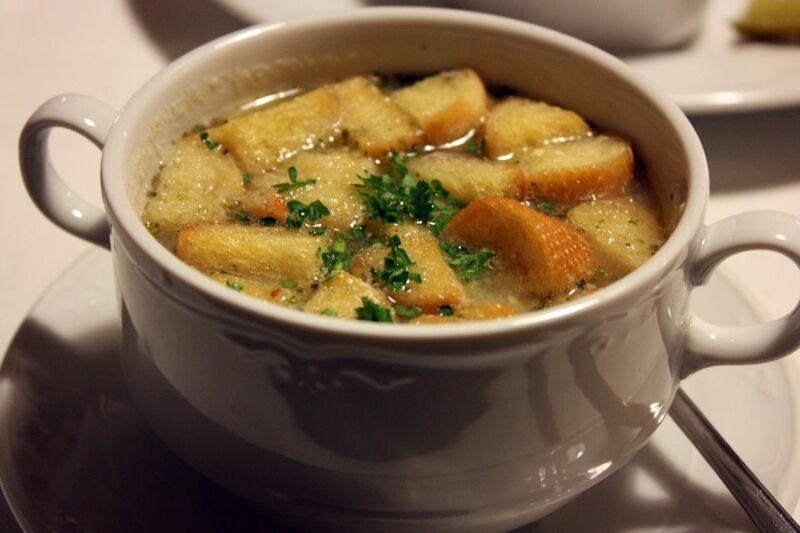 This Czech garlic soup recipe or česnečka is said to be the number one hangover cure in the Czech Republic. It's a simple affair of broth, potatoes, garlic, and onions. This soup is so quick to make, many housewives and mothers rise early in the morning to stir up a pot of this easy dish for their spouses and family members after a night of partying. Garlic soup is by no means the only food eaten to chase away the effects of enthusiastic celebrations. In a medium saucepan, melt bacon fat or butter. Add onions and garlic and cook until translucent. Add hot stock and bring to a boil. Add potatoes, return to the boil, reduce heat and simmer until potatoes are tender. Adjust seasoning and, for a stronger garlic taste, add 3 cloves crushed garlic (not minced). Serve immediately with croutons and grated cheese of choice. Spanish Garlic Soup Recipe: This peasant dish is traditional in the colder regions of Spain where soups and stews are eaten daily. This recipe makes use of stale bread. Georgian Lamb and Rice Soup Recipe: This traditional Georgian soup has a healthy dose of garlic cloves along with lamb shoulder, rice and chopped sour plum roll known as tklapi. Vegan Roasted Garlic and Lemon Soup Recipe: This creamy soup combines roasted garlic and lemon to offer brightness and a fresh-tasting finish. Garlic Tonic Soup Recipe: Garlic has long been touted as a healing vegetable. Even though this recipe calls for an entire head of garlic, the soup is soothing, mellow and mild. It can be used at the first sign of a cold or other illness or enjoyed regularly to support a healthy immune system.